Welcome to Yola. Creating an eye-catching, professional looking site has never been easier! Yola's Template Gallery offers high quality, attractive designs that you can use for either your business or personal needs. We are excited to take you through this process. Let's get started! 1. The first thing you need to do is sign up for a Yola account. You can do this by clicking Start for Free. 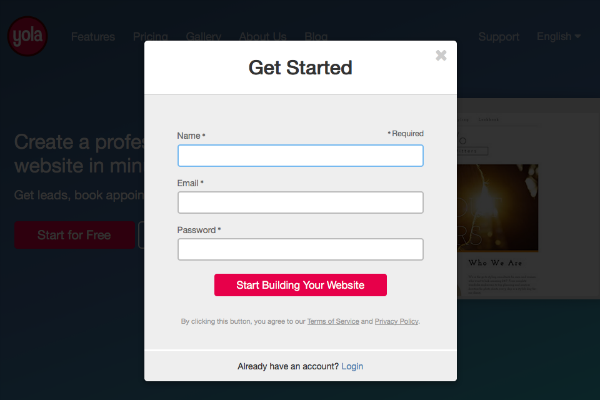 A Get Started dialog box will open. Enter in your name, email address and password and click Start building your website. 2. 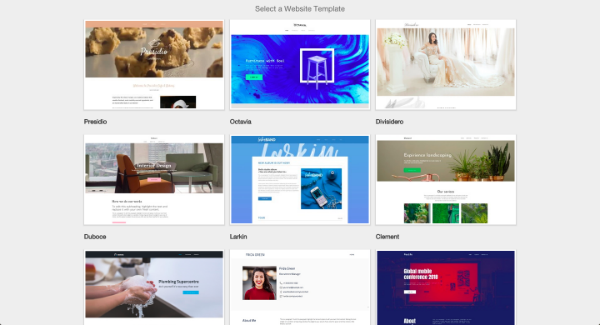 Upon successfully creating an account, you will be taken immediately to our Template Gallery page where you can view and select a preset theme to use for your site. 3. 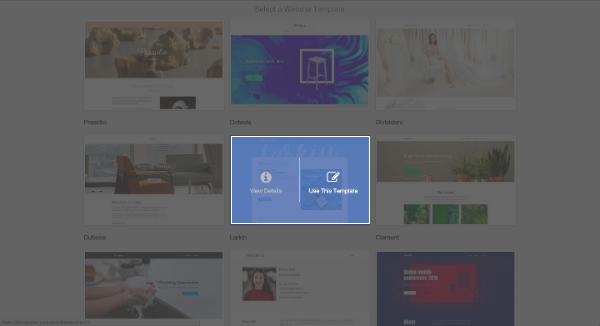 To learn more about each template, you can hover over the thumbnail. An overlay will slide up giving you the option to “View details”. By clicking on View Details, a larger thumbnail will open up at the top of the page, describing the template and the features it offers. When you’ve determined the template you are going to use, click Use This Template. 4. 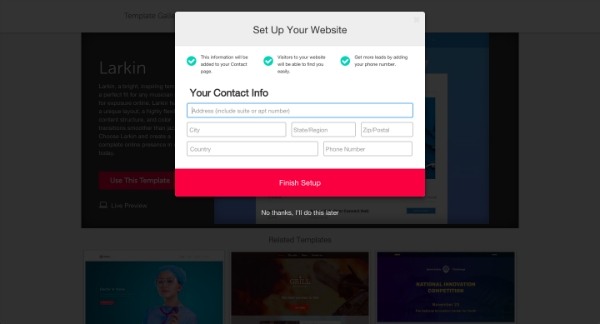 Now we can start the process of putting your website together. 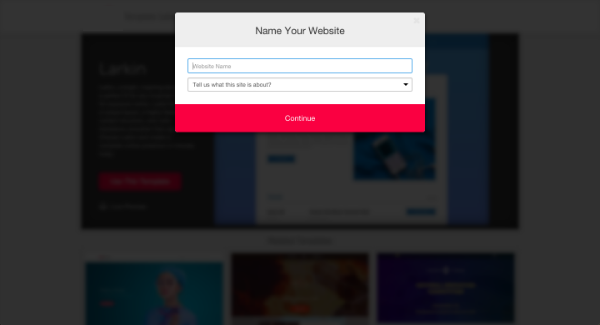 You will be asked to “Name Your Website”. This can always be changed later if you need to make any adjustments. 5. The first thing you’ll see is a place to add in your contact information where your visitors can reach you. It will be placed on your Contact page. If you have a business, this would be a great place to add your business contact information. This information will also correlate with your footer. Once you’ve added your information, click Finish Setup. If you wish to skip this step, you can click No thanks, I’ll do this later. 6. Now, you can sit back and relax as your site is put together. 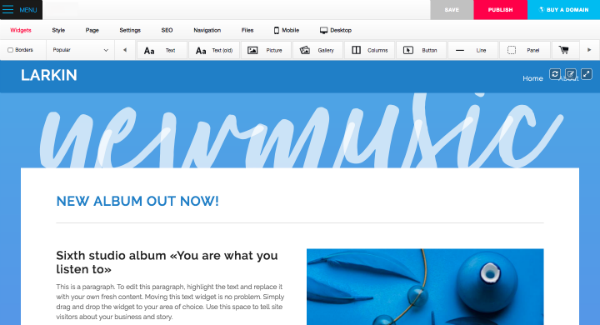 Upon completion, you’ll see that your new site has a basic layout with some Text and Picture widgets. You can begin tweaking the content and/or adding your own content and pictures. We have an extensive collection of tutorials to help you get started with adding content to your site. You can find them here: Basics - Getting Started. When you are happy with your site click the Publish button. From the publishing dialog box, you can now select to publish to a custom domain, a free Yola subdomain or a domain you already own (this is only available to Yola Bronze, Yola Silver and Yola Gold subscribers, and certain partner programs). To learn about the best choice for you please see Publishing Options. Once you make your selection, your site will be live on the internet!